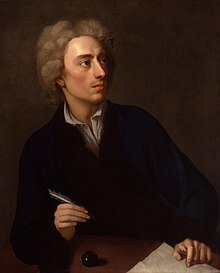 Alexander Pope (21 May 1688– 30 May 1744) is generally regarded as the greatest English poet of the eighteenth century. He is best known for his satirical verse and for his translation of Homer. He is the third most frequently quoted writer in The Oxford Dictionary of Quotations, after Shakespeare and Tennyson. Pope was a master of the heroic couplet. This page was last changed on 9 April 2013, at 15:34.